Emily Blunt won us over with her charming American Vogue cover last month and works her magic again while making a delightful appearance on British Harper’s Bazaar. We should’ve known the magazine would do the Brit actress justice, with Emily receiving the full UK Bazaar experience for her cover shoot. Photographed by Richard Phibbs and styled by Miranda Almond wearing a red Dolce & Gabbana dress, the Mary Poppins Returns star looks elegant, regal and practically perfect in every way on the newsstand cover for January 2019. It’s safe to say our forum members will be running to the newsstand for a copy. “Very pretty. 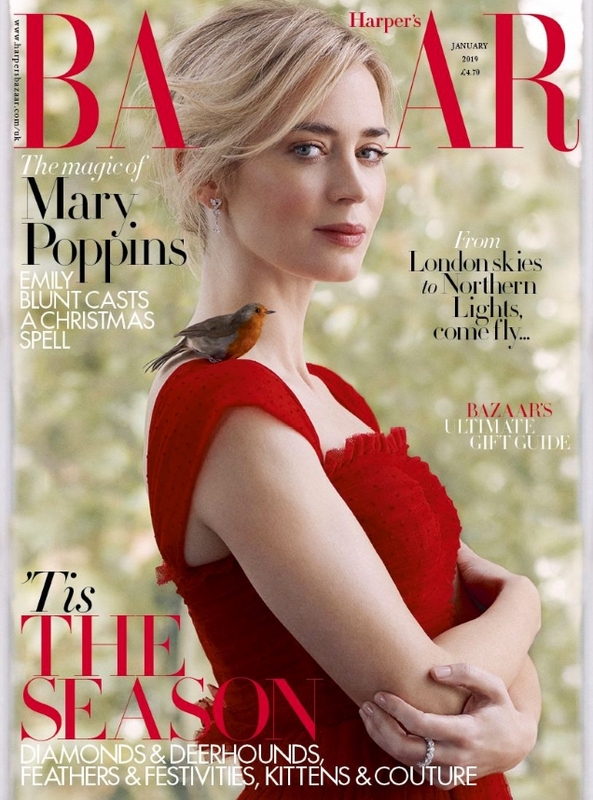 I loved the literal take US Vogue took with Emily/Mary Poppins, but I also really enjoy the more subtle nod here with the bird on her shoulder; it feels very festive too, which is nice for a January issue,” applauded LastNight. “…and this is how you use a theme in a subtle way!” echoed kokobombon. “Lovely, very pretty and subtle, just perfect,” Nymphaea admired. “Oh I love this. Love Emily anyway, think she always photographs so well, but this is really classic in its beauty,” complimented honeycombchild. “Well done HB. Beautiful and not cheesy like US Vogue,” said GivenchyAddict. “Definitely agree, but doesn’t make that much less of a great cover. This Brits get it right once more!” heralded SLFC. Check out Emily accompanying cover shoot, as well as the special subscribers cover and join the conversation here.